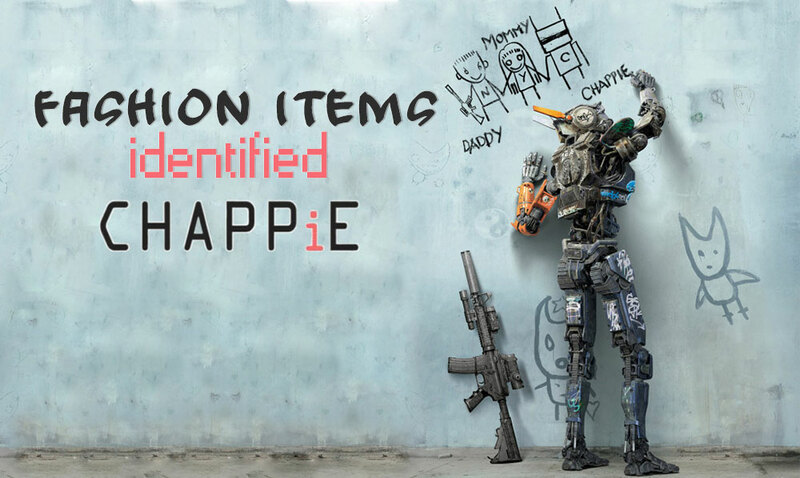 If you’re a fan of AI movies or of Neill Blomkamp’s cinematic perspective, you have to see Chappie! Although I was a bit hesitant, knowing the main idea behind the movie (Artificial Intelligence), I admit I was completely blown away by the ultimate twist and the visuals of the movie. You will be too! Where the Wachowskis movies are failing, Neill Blomkamp is brilliantly sustaining and radiating: smart, fun SF movies putting ideas out there without over-speculating and over-philosophizing! 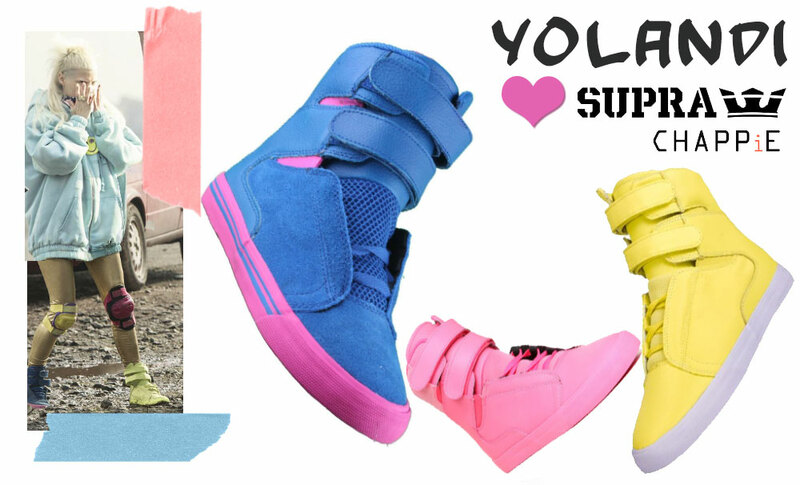 In all the shades of the rainbow, and if possible mismatched, the Supra sneakers worn by Yolandi definitely make her look pop even more. She clearly wears things that you’d hardly consider acceptable or sometimes even decent, but that’s Yo-Landi alright! She’s faithful to her style at such point that you can easily identify things you’ve seen her wear in her Die Antwoord music videos! Yolandi’s look is a character on its own right and a mighty powerful one! The only thing more colorful, more vivid and more heartmelting than her style is Chappie. And yes, I do realize how that sounds odd, since I’m talking about a robot! But you have to take my word on it and go see it. Both the director, Neill Blomkamp and Sharlto Copley, Chappie’s interpreter, made an amazing job in bringing this story to life. In bringing Chappie to life! 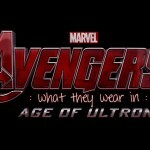 See also: Captain America fashion items: identified! 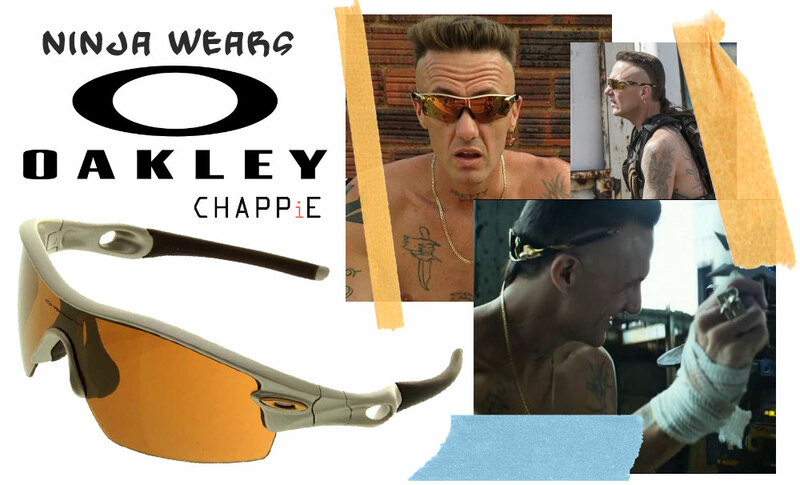 One of the few things Ninja is seen wearing throughout the movie, his sunglasses, come from Oakley. The Radarlock Pitch model falls right in Ninja’s style alley as he holds true to his personal Zef style fashion seen over the years in Die Antwoord’s videos. 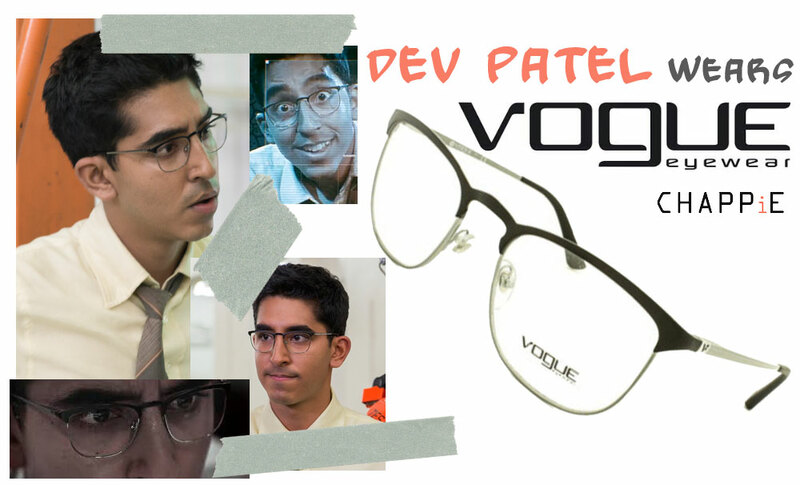 Dev Patel’s character, Deon Wilson, is wonderful, although lightly crayoned, we can discern the kind of person he is. A nerdy, brilliant guy who wears a pair of Vogue eyeglasses, matching shirt and tie and is so dedicated and passionate about artificial intelligence that he’s willing to take enormous risks to ‘Craft Life’ and not go along with leaving ‘Life Craft You’ philosophy. 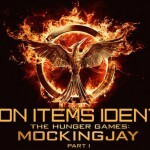 See also: Hunger Games fashion items: identified! A respected, reliable brand, Hush Puppies for a respected, talented individual who seems to be the only one living in a traditional society but at the same time is the undeniable prodigy of the movie. Invested, intelligent, restless, Deon Wilson is dressed to mingle yet his mind is brilliantly taking the world where it has never been before! 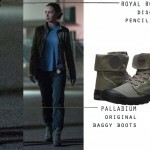 See also: The Maze Runner boots! 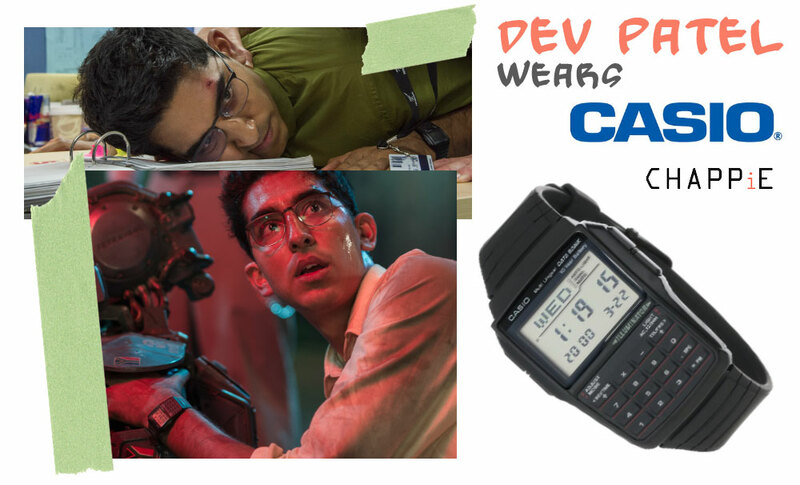 In an era of smartwatches (not even smartphones are seen in Chappie, as advanced as the robotics are, there’s no Apple in sight!) an old calculator watch has a special mission in this movie. 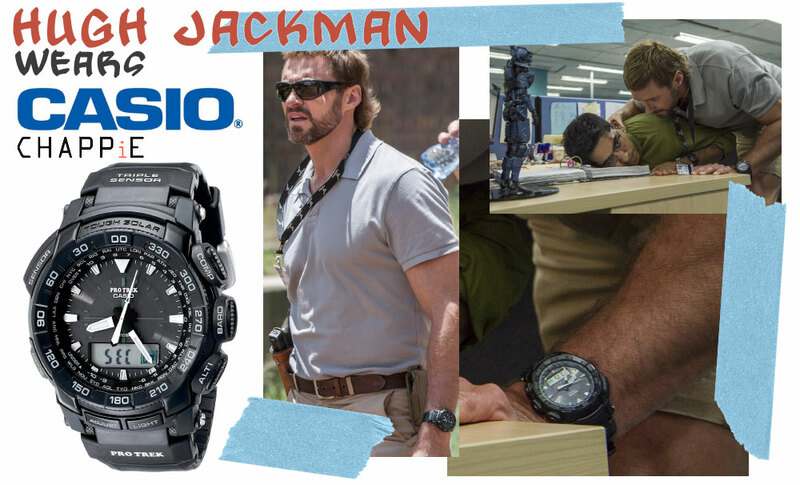 Besides being worn by one of the main characters – Deon Wilson, there’s so much more it does when it comes off the wrist! But I dislike spoilers, so this is the most you’ll hear me say about the watch scenes in question! 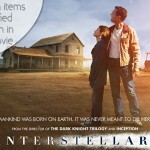 I’m sure you’ll discover the moment in the movie! 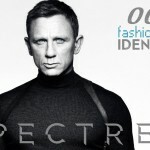 Just remember: geek is definitely chic! See also: Pierce Brosnan watches as seen on screen! 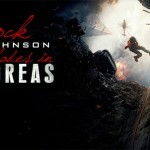 As Vincent Moore, Hugh Jackman is unrecognizable yet his acting is top notch, as always! From his mullet haircut to his unusual military-like style, Jackman’s character is not even trying to convince everyone that he’s true to his profile – it’s clear as daylight. His remarkably unstylish Khaki wardrobe includes short pants at work – why, yes! 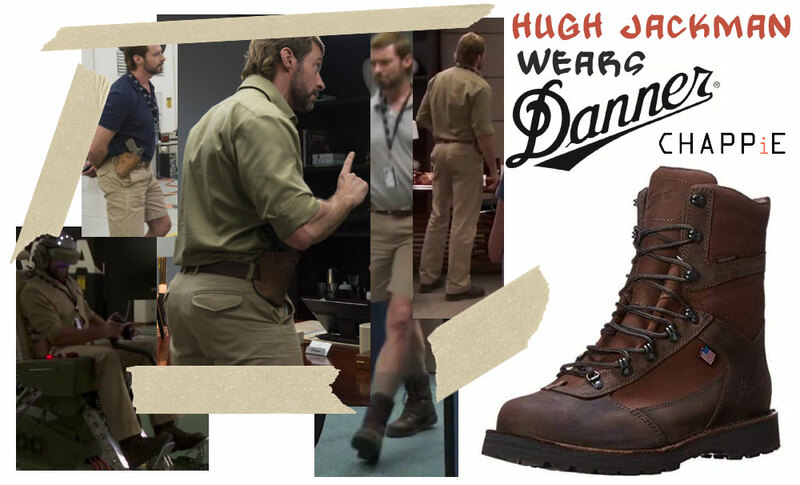 But only with the matching hiking boots from Danner – the perfect office attire! if you’re going hunting! 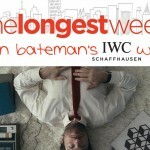 See also: The exclusive IWC watch worn by Jason Bateman in one of his movies! Trying to impress with the advanced levels of technology, Vincent Moore is not only pitching the Moose but he’s also wearing one of the most hi-tech Casio timepieces: the PRG550-1A1 (in black). It can measure temperature, altitude and atmospheric pressure and compass bearing through a triple sensor mechanism, all powered by Solar technology. you are in correct in color and style on Oakley sunglasses. I called Oakley the company, all thought they are Oakleys you got everything else wrong. sorry…. Hi Jim! Thanks for stopping by and letting me know – I actually had eyes on the props used in the movie so that’s where the error came from! So what did Oakley (officially) stated they supplied?